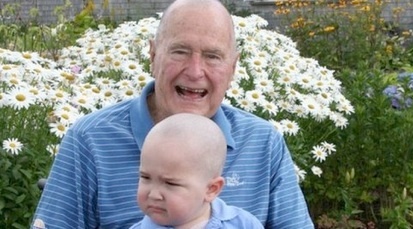 George H. W. Bush has recently shaved his head in an act of solidarity for a two-year-old son of one of his Secret Service entourage. 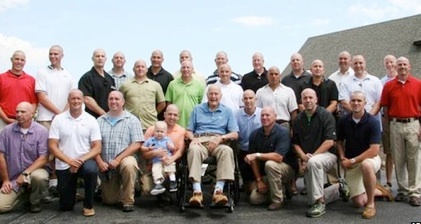 The child has Leukemia. The Reuters’ photo below pictures GHWB with the boy. Our sincerest sympathies to the agent whose son is so afflicted. ...I count 26 Agents all assigned to GHWB at an annual cost with benefits and retirement at $250,000 per year, not including transportation and per diem for travel, and expenses at whorehouses in Columbia (remember?). That’s a very modest total of $6.5 million more. All in? Probably 15 to 20 million US Dollars per year for every ex-thief so coddled. When will we rid ourselves of this Republicrat albatross? Why are you not outraged?